Download and listen through iTunes! On the third episode of the Critically Comics podcast, Steven and Tara discuss Marvel’s Squirrel Girl by Ryan North and Erica Henderson! This episode covers the first three volumes of the series and the representation of the character in outside media. Will Squirrel Girl be the best comedy series to be introduced into the canon or will it divide the hosts? Join the debate and let us know what you think of the series! 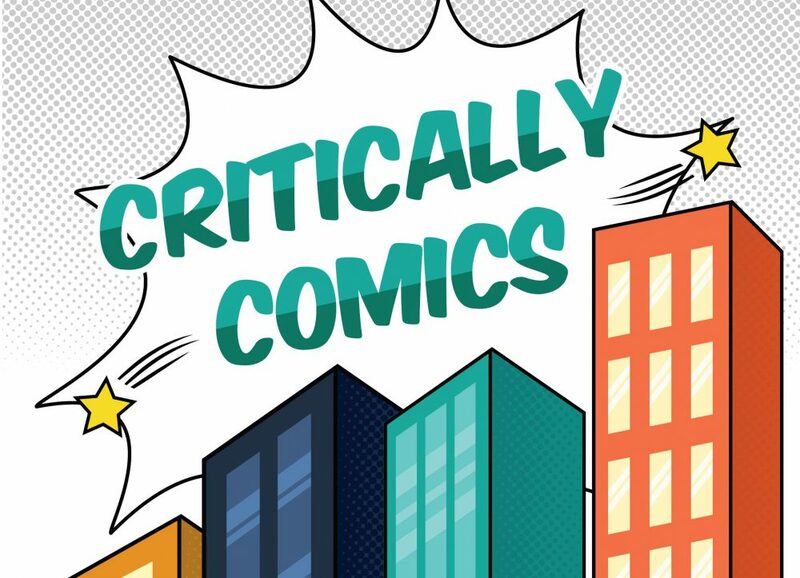 Welcome back to the second episode of Critically Comics! This month Tara & Steve discuss the 1992 Pulitzer Prize wining graphic novel, Maus by Art Spiegelman. We discuss the legacy of Maus and how it manages to be more than just a depiction of the Holocaust with cats and mice. Download and listen now! Let us know your thoughts as to whether or not Maus goes into the comics canon! Listen here or through the Apple iTunes store! Original image appeared in Uncanny X-Men #168 (1983) by Chris Claremont and Paul Smith. When Critically Comics was still in its incubation stages, we debated if we should have addressed Bill Maher’s previous comments regarding comic books and the associated fandom. Ultimately, we decided to pass on doing anything about the comments, thinking that by the time the site went live almost everyone would’ve forgotten about Maher’s comments. However, on this week’s episode of HBO’s Real Time with Bill Maher, the host decided to up the ante on his anti-comic sentiments by stating that those who believe comic books are any form of literature need to “grow up.” To add insult to injury, he proudly proclaimed he was sad that “[comic book fans] are still alive.” With the broadcast of these new inflammatory comments, we’ve decided to address Maher’s tirade. The most important thing to remember about Maher is that he is, first and foremost, a comedian. Maher got his start doing stand-up in New York during the early 1980’s and rose quickly due to his naturally smug persona, quick wit, and fearlessness. Politically Incorrect with Bill Maher was the show that granted him the ability to speak on air to comedians, politicians and other influencers about current day issues. ABC decided to cancel Politically Incorrect in 2001 due to controversial comments Maher made on air. However, due to the fan base that Maher had amassed over the years, HBO hired him to develop Real Time with Bill Maher, which premiered in 2003 and is currently in its seventeenth season. Maher has used both of his television programs to tackle social issues with his trademark wit and aggressive onstage persona. Describing himself as a “rational” person with progressive liberal views, Maher never attempted to hide his disdain for those he disagrees with. Despite identifying as liberal, Maher has often taken an authoritarian-type persona where forces his beliefs on others. A prime example of Maher’s self righteousness is the title of his 2011 book —The New New Rules: A Funny Look At How Everybody But Me Has Their Head Up Their Asses. While we agree with some of his politics (Maher has been on the board PETA board since 1997), it is undeniable that Maher has a serious issue with demeaning those he disagrees with. With his January 25, 2019 tirade, Maher focuses on a towards a long-standing stereotype that has plagued the comic book community. Maher made it clear that he believes the average comic book fan to “play with dolls”, “[have] X-Men bedsheets” and be a virgin (“there’s a reason why comic books are sold next to Pokemon cards and not on the aisle with the condoms and the lubes”). Essentially, Maher believes every book fan to be a mirror image of The Simpsons’ s Jeff Albertson – a.k.a. Comic Book Guy. To pretend that some comic book fans don’t match that description is asinine. Yes, there are some individuals out there are who live up to the stereotype of the fabled and basement dwelling “neckbeard”. However, out of the millions of individuals who enjoy comic books and superheroes, not everyone fits that mold. Painting groups of people in such broad strokes is par the course for Maher, who has spent decades reducing entire political ideologies to a small and outlandish core that Maher has targeted for comedic effect. One individual that Maher calls out as belonging to his perception of the comic book community is Kevin Smith. Smith is an easy target due to the image he has created over the years; Smith leans into the stereotype of a comic book fan by making it a part of his core identity and openly talking about his love of the industry. Smith has cultivated an image of being an easy going and approachable celebrity — similar to the way Maher has cultivated his own image of being a lighting rod of controversy. We will eventually get around to discussing Smith’s comics work (primarily his Green Arrow and Daredevil arcs), and the issues we have with how Smith presents himself to the world as a comic book fan. While we may not agree with Smith’s viewpoints (or how he expresses them), we can still recognize the great work he has done for the comic book community without wanting to be represented by him. Similarly, as a self-identifying liberals, we surely do not want individuals to think that Maher represents all components of our political beliefs. Maher openly mocks the idea of graphic novels being put on the shelf as other recognized literary greats, putting him in direct opposition to a belief we strongly hold at Critically Comics. Maher suggests that Americans are wasting their time by reading “childish” comic books when they should be reading the works of James Baldwin, Toni Morrison, and Michael Eric Dyson. He rebuffs the idea that Steinbeck, Melville or Shakespeare were ever met with criticism for their works. Balwin, Morrison, and Dyson are amazing, and you will never hear us say that you shouldn’t read them. But to assume that any author is never met with any criticism is ignorant at best. Let’s break that argument down. East of Eden by John Steinbeck was described as “a huge grab bag in which pointlessness and preposterous melodrama pop up frequently as good storytelling and plausible conduct.” But perhaps more interestingly, Steinbeck intended for East of Eden to be “so simple in its difficulty that a child can understand it.” For him, childishness is desirable trait in good writing. Which makes sense; after all, when experts teach writing, one of the key skills they focus on is clarity. Writing, reading, and manipulating language are all ways of communicating, as are speech, body language, and pictures. Maher fails to realize that the multimodal nature of comic books invite readers to analyze the content that is on the page. In November 2018, Maher posted on his blog that “Dumb people got to be professors by writing theses with titles like Otherness and Heterodoxy in the Silver Surfer”. ( That article can be found here). Comics, like all art forms, cause individuals to critique and analyze what creators put out into world. What separates comics from other forms of art is that it actually combines the fields of literature and art, and allows for a much clearer artistic vision. For decades people have debated the animalistic nature of Heathcliff in Emily Bronte’s Wuethering Heights and fantasized about J.R.R. Tolkien’s descriptions of the Shire. Similarly, artists have debated the true meaning behind the Mona Lisa’s smile or the logic behind DuChamp’s The Fountain. While art is meant to be subjective, sometimes artist’s message can unintentionally be lost. Comics allow for creators to precisely convey their vision to the readers. Writing and art when separated are highly upheld in their own respective disciplines — so why is it so hard to appreciate the two the moment they are paired together? If it is acceptable to dedicate your life to studying the plays of Tennessee Williams or the art of Pablo Picasso, then it should be acceptable to dedicate your life to the art of Jack Kirby or the words of Grant Morrison. If Maher’s own argumentative style were used against him, his entire argument would be reduced to the soundbite of: “Comic books are not great literature…superhero films are not great pieces of cinema.” When determining what novels have literary merit, it is clear what criteria must be met; in order for a novel to be considered “literature”, typically the work has a timeless story, is written in a distinctive writing style, and has had some type of historical significance. Superhero comics provide timeless stories with their easily recognized characters who mostly share the same universe. The shared universe aspect of comic books are unique only to the comic book industry. The most ambitious examples of shared universe in literature are J.R.R. Tolkien’s Middle Earth series and the underlying weave of the Dark Tower series that loosely connects almost all of Stephen King’s fictional works. By writing stories in a a shared universe as big as the DC or Marvel Universe , most creators don’t have to spend time focusing on world building since it has already been done by previous writers. This frees creators up to focus on telling stores and exploring themes that interest them. The same way that Faulkner, Dostoyevsky, and Hemingway had themes and writing styles personal to them, certain comic creators can be identified in a single panel due to their signature style leaping off the page. For example, if you have a panel in which characters are contemplating their existence in the multiverse while flying through a submarine powered by sound — you are most likely reading a book by Grant Morrison. Similarly, the use of shadows and earth tones in Mike Mignola’s work make his work instantly recognizable. Some works have achieved social significant and received some of the highest awards in the literary field. Significant achievements achieved by comic book creators included Alan Moore & David Gbbons’s Watchmen winning the Hugo Award 1988, Neil Gaiman’s Sandman winning the World Fantasy Award in 1991, Art Spiegelman’s Maus winning the Pulitzer Prize in 1992, and Ron Lewis’s March winning the Robert F. Kennedy Award in 2014. Even if superheroes are unappealing to you, there are still plenty of other comic books that focus on a variety of other topics. We would personally recommend, Warren Ellis’s Transmetropolitan and Alan Moore’s V for Vendetta to Maher due to the graphic novels’ underlying themes of journalism, anti-authoritarian and the importance of free will. Who is Maher to criticize the medium in which Civil Rights Leader John Lewis published his memoir? In addition to exploring timeless themes, comics also allow the reader a form of escapism. In his November broadcast, Maher used comics as a partial scape goat for the election of Donald Trump; Maher stated “Donald Trump could only get elected in a country that thinks comic books are important.” Maher has it wrong — in a country where Donald Trump is president, it is impossible to not see comics as important. Comics provide readers with worlds in which tyranny is battled and people can openly stand up to bullies. Due to the visual component of the medium, comics also allow for the representation of minority groups that are often underserved by other mediums. While comics face scrutiny from fans who do not wish to see inclusivity in the medium, such as the “Comicsgate” scandal from 2018, the comics community is able to rise above that level of hate. The characters that found themselves in the center of the Comicsgate scandal, (Kamala Khan/ Ms. Marvel, Miles Morales/ Spider-Man and Riri Williams / Ironheart) have continued to find success with both fans and critics. Even though it is easy to dismiss comics as escapism, at least they are a form of escapism that allow for powerful social messages to be conveyed. Finally, the last comment we want to address is Maher’s most hurtful statement: “I’m not glad that Stan Lee is dead, I’m sad that you are still alive.” The pure spite that is in this statement goes against everything the comic industry stands for. At its core, comics are about individuals overcoming adversity. The beautiful things about the comic book industry is that it always meets the challenges against it while inspiring its fans to overcome the own challenges they face in their own life. People get particular panels or emblems permanently tattooed to constantly remind them of their own strength that they discovered through comic books. The fact that comics inspire so many people is the reason why comic books will outlive a self-righteous bully who over-simplifies an entire industry for a series of poorly thought out jokes.